Archaeologists love “unearthing” the mysteries of history. In this post, we explore the fragmented past of crown window glass, a common artifact type connected with the production of glass windows in the 17th, 18th, and 19th centuries. 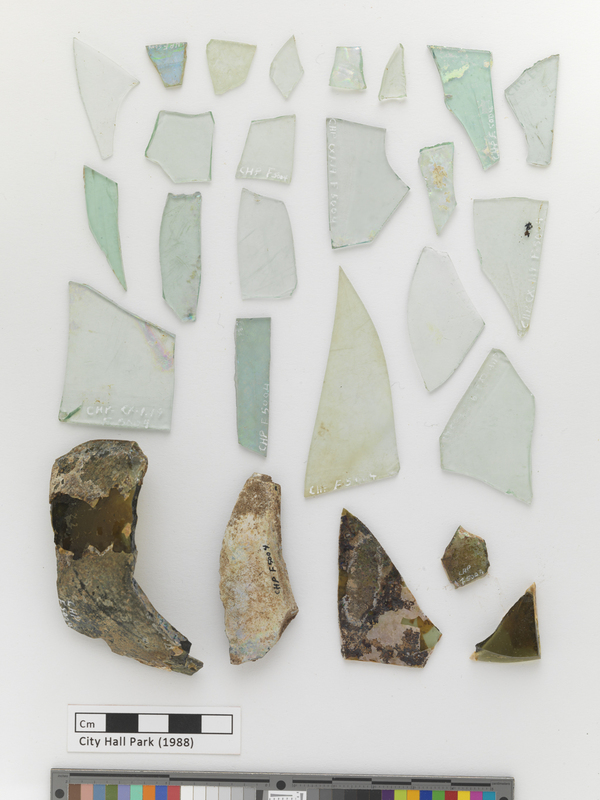 Small, flat fragments of glass are often found in archaeological sites in New York City – these fragments could be from bottles, from late 19th century plate-glass windows, or from crown glass windows, which are hand-made and date to an earlier period in the City’s past. But how can we tell one type from another? An assortment of glass fragments unearthed in City Hall Park. Are they bottle glass? 19th Century plate-glass? Or earlier, hand spun, crown glass? Read on to find out more! The key to identifying crown glass is in the way it was produced. Crown windows are made by hand blowing glass into a globe known as a “crown”. It would then be flattened by spinning the globe glass into a disk. After several days of cooling, squares would be cut from the disk and made into window panes. These panes would have either been cut by glass-makers themselves or purchased in disks and then cut to fit windows as buildings were being constructed. When it comes to window glass production, it’s all about trees, trees, trees! Furnaces required a lot of wood to process sand, ash, and lead into molten glass. While colonial New Amsterdam was burgeoning into a major port for trade and production, much of Manhattan island remained heavily forested – creating an ideal environment for businesses that needed to use glass furnaces. Most early glasshouses were found outside of the city limits, where trees grew in abundance. By the 1640’s, “Glass Maker’s Street” (now South Williams Street) became the first production center for a new method known as crown window glass – located just outside the colonial city wall at present day Wall Street. This method of making window pane glass would continue until the 1850s when other techniques, such as plate-glass making, became easier and more cost-effective to produce the large quantity of glass required to keep pace with a growing city. 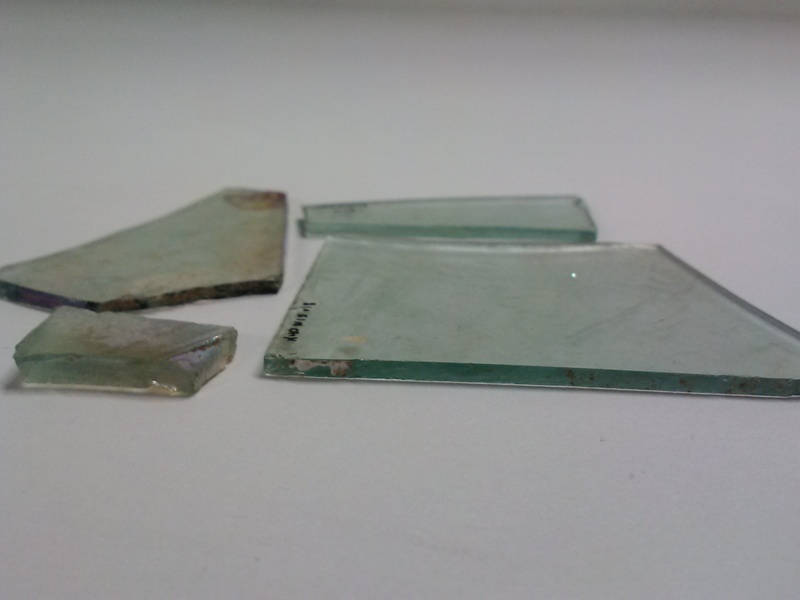 But how can you identify fragments of crown glass in an archaeological context? 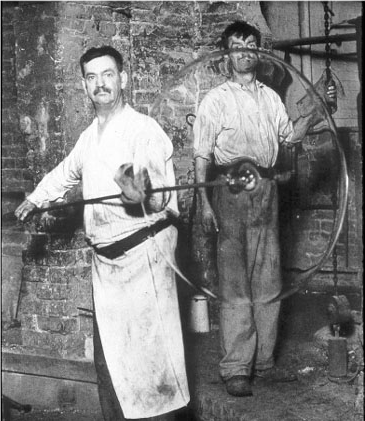 Crown glass varies in thickness because window panes were cut out from different areas of the spun disk. Glass disks were thickest in the center and thinnest near the edge, and had a circular pool in the center. Similarly, the edges may be rounded from having been spun by glass makers. Like snowflakes, no two pieces of crown glass are alike. Crown window glass fragments of varying thickness, viewed from the side. While it is possible to identify crown glass by its production inconsistencies, this same thing makes dating crown glass difficult. In some cases, we can only assign a date within the time period when crown glass was being produced prior to the 1850s. Do you have a trick for dating crown glass? Let us know in the comments! These artifacts, and many more, are being cataloged and digitized at the Museum of the City of New York as preparation for public access and long-term care at the Landmarks Preservation Commission Archaeological Repository. 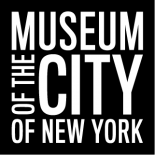 Research inquiries can be directed to archaeology@lpc.nyc.gov. More information on the project can be found here. This entry was posted on November 25, 2014 by aberry04 in Archaeology project and tagged 1800s.